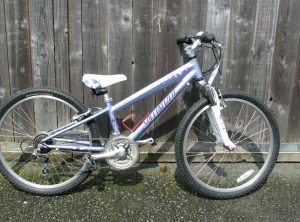 ALL USED BIKES ARE COLLECTION ONLY FROM OUR PREMISES IN EVENJOBB LD8 2SA (on the Mid-Wales/England border). Condition: Excellent condition, fully serviced. 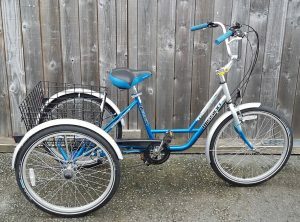 Fitted with rear carrier rack, mudguards, comfort seat, hub dynamo lights and adjustable stem. Condition: Excellent condition, this started as a bare frame and has had mostly brand new parts fitted – Suntour XCT 100mm forks, mechanical disc brakes front and rear, wheels, tyres, tubes, gear shifters, front and rear gear mechs, chain, chainset, pedals, bottom bracket, cables. Genuine Giant seat, Easton bars and stem. Fully serviced..